Owned by the famous Irish bookmaker Paddy Power, Sportsbet.com.au has been in operation for over 15 years, firmly establishing itself as one of the leading online sports betting sites in the market. 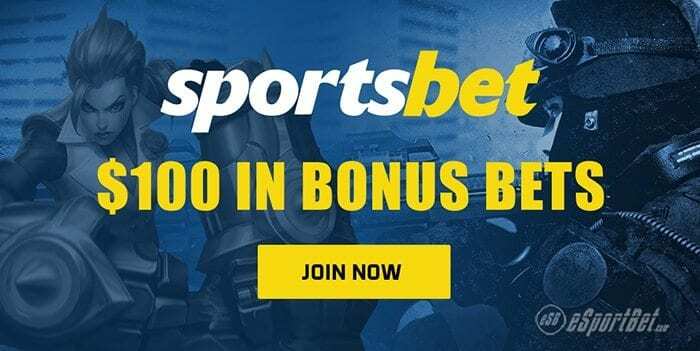 We review Sportsbet.com.au to see how the site fares in terms of esports betting markets and look at the bonus offers, deposit options, wagering options and security to determine if this is a recommended venue for real money esports bets. Afghanistan, Algeria, American Samoa, Andorra, Angola, Armenia, Aruba, Austria, Azerbaijan, Bahamas, Bahrain, Barbados, Belarus, Belgium, Bosnia, Brazil, Brunei, Bulgaria, Burma, Canada, China, China (Hong Kong S.A.R. ), Congo (Republic of the), Cote D’Ivoire, Croatia, Cuba, Cyprus, Denmark, Estonia, Finland, France, French Guiana, French Polynesia, French Southern Territories, Georgia, Germany, Greece, Greenland, Guadeloupe, Guam, Guernsey, Guyana, Iran, Iraq, Ireland, Israel, Italy, Jamaica, Kosovo, Kuwait, Latvia, Lebanon, Liberia, Libya, Macau, Macedonia, Malta, Marshall Islands, Martinique, Mayotte, Mexico, Micronesia, Moldova, Monaco, Montenegro, Myanmar, Netherlands, New Caledonia, Nigeria, North Korea, Northern Mariana Islands, Norway, Pakistan, Palestinian Territories, Puerto Rico, Republic of South Sudan, Reunion, Russia, Rwanda, Saint Barthelemy, Saint Martin, Saint Pierre and Miquelon, Sierra Leone, Singapore, Slovakia, Slovenia, South Africa, Spain, Sudan, Sweden, Switzerland, Syria, Taiwan, Tanzania, Timor-Leste (Democratic Republic of), Tunisia, Turkey, Turkmenistan, Uguanda, Ukraine, United Kingdom (Great Britain), United States, United States Minor Outlying Islands, Vatican City State (Holy See), Virgin Islands (US), Wallis And Futuna Islands, Yemen, Zimbabwe. New punters who sign up for an account at Sportsbet may be eligible for a matched First Bet Bonus of up to $100 when depositing real money for the first time. The First Bet Bonus is available to use within 30 days of making your first cash deposit and can be used on any sporting event bet type of Multibet. Your eligibility to claim this bonus offer will depend on the location you’re signing up from (for example, residents of certain Australian states are not eligible for the sign-up bonus). Once you have registered with Sportsbet, you can check your account at any time to see what special promotions are available for you to take advantage of. There’s also a loyalty rewards program for regular punters, and a Refer-A-Friend bonus. What esports events can I bet on at Sports Bet? The range of esports betting events available to wager on at Sportsbet depends on the current esports tournament schedule. At the time of writing this review, there were some great markets available for the League of Legends World Championships, but only a few basic bets available for smaller Counter Strike: Global Offensive, Overwatch and Dota 2 events. This a good blend of basic and exotic bets, but if you’re looking for greater variety of esports to wager on, like Heroes of the Storm, Hearthstone and StarCraft II, check out William Hill or Bet365 for a wider selection of esports betting markets. What other sports can I bet on? There’s also a Politics and Novelty market section, where you can bet real money on the outcome of certain political campaigns, current affairs, entertainment industry happenings, music releases and royal family events, which can make for some fun entertainment on the side of your esports betting ventures. Sports Bet offers fewer banking options than some of the other top-rated esports betting sites, but with all the safest, major options covered there should be something here to suit all punters. Note that Sportsbet does not accept deposits using American Express (AMEX), Diners Club, or some prepaid and virtual cards, and that some banks will block credit card payments made to Sportsbet depending on their terms and conditions regarding the facilitation of online gambling transactions (check with your financial provider for further information). Withdrawals at Sportsbet can be made using credit card, PayPal, Skrill or cheque. You need to verify your identity before you can withdraw any winnings via Sportsbet, and you must play-through the amount of your deposit at least once before you can cash-out. For example, if you deposit $50, you must make $50 worth of bets at the site before you can withdraw the balance from your account. Note: Despite accepting the above currencies, Sportsbet.com does not accept account registrations from punters in the UK, USA or Singapore. The Sportsbet Help Centre provides a comprehensive platform to seek answers to commonly asked questions, and unless you are experiencing a unique problem, you are likely to find the answer you are looking for here. However, there are plenty of options available if you need to speak to a Sportsbet customer service member directly, with help available via live chat, phone and email. Phone help is available Monday to Saturday from 8am to 11pm (AEST) and Sunday 9am to 9pm (AEST). Live chat and email assistance is manned between 7am and midnight Monday to Saturday and 8am to 9pm on Sunday. Go to sportsbet.com and check the contacts page for the local phone numbers available to your location. In terms of reputation and trustworthiness, Sportsbet comes highly recommended. This site offers punters a secure, user-friendly platform to peruse a long list of betting markets, make instant deposits and place real money bets online. In terms of esports betting options, Sportsbet is decent, with some good markets available on the LOL World Championships at the time of writing, but still not as many options as some other rival bookies.